We are very pleased to publish another SPERI Paper by Professor Richard Jones, Associate Fellow of SPERI and Pro-Vice-Chancellor for Research & Innovation at the University of Sheffield. In the Paper, Innovation, research and the UK’s productivity crisis, Richard shows that the UK’s slowdown in productivity is unprecedented and argues that, if this trend continues, UK living standards will continue to stagnate and the government’s ambition to eliminate the deficit will fail. 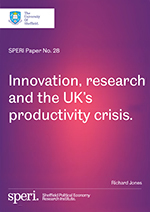 The paper explores the connection between the UK’s poor productivity performance and the low R&D intensity of its economy in several industrial sectors, and tests some explanations of the productivity slowdown. The decline of North Sea oil and gas and the end of the financial services bubble play a special role in the UK’s poor recent performance, but the author argues that they do not explain the whole of the problem. Richard concludes that, in response, the UK government will need to take a more active role in procuring and driving technological innovation, particularly in areas where such innovation is required to meet the strategic goals of the state. A new political economy of technological innovation is needed. Download SPERI Paper No. 28: Innovation, research and the UK’s productivity crisis.